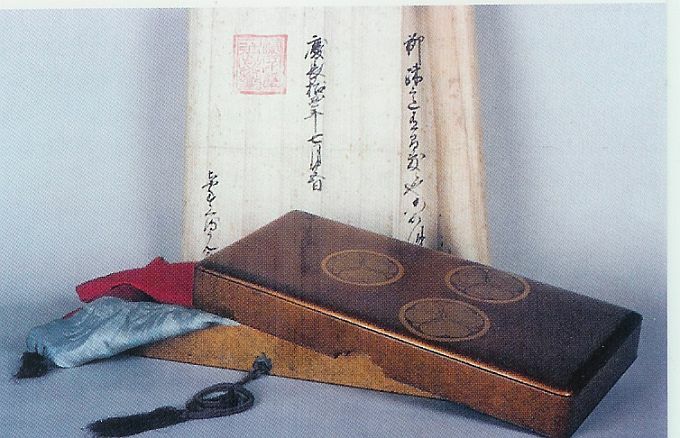 interest with one item in our collection with the inscription of Namban Tetsu. antique shop in December 1977 in The Hague. Together with the original pole the length exceeds the 3 meters. 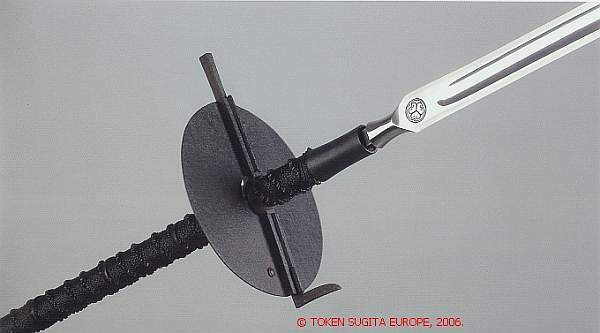 and on the blade there is the Aoi Mon ( = Family Crest of the Tokugawa Family ). in Edo, and SHIROEMON became head of the house in Echizen. It is not known when EDO SANDAI passed away. Tōken Sugita Japan. It was polished by Mr. Shimamura, a good friend of Mr. Sugita. to be preserved ) certificate nr. 146993. The sword smith KANENORI was trained in the Shimosaka school of sword smiths. Kanenori, Ōmi-no-kami Tsuguhira, Tsuguhiro and Hyūga-daijō Sadatsugu. 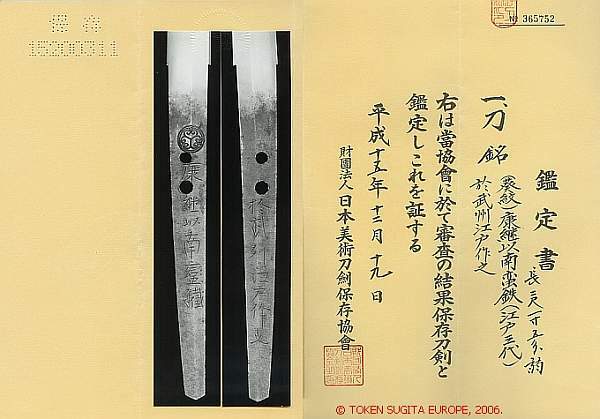 This sword also has been qualified with the status of Tokubetsu Hozon. ( = Especially worthwhile to be preserved ) certificate nr. 142290.
the term Namban Tetsu and all that was related to it. 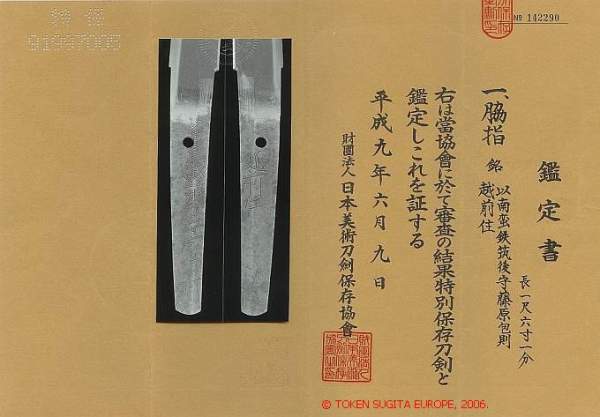 could be established for modern sword smiths using Namban Tetsu. This was the start of what can be called now the  'Namban Tetsu Project'. Why the special attention for Namban Tetsu ? How did Namban Tetsu  get into Japan ? In our search for  Namban Tetsu   we have to go back in history. To be precise to the year 1600.
only 24 or 25 survivors from a total of 110 people. They are in a terrible condition. shortly after. An inventory  was made  the next day by  the  local authorities. bullets of  cast iron, gunpowder and so on. were free to go where they wanted. trip  sailing  under  Japanese flag the  ship was  wrecked in  a storm. Shogun TOKUGAWA IEYASU  during  the battle  of SEKIGAHARA. bakufu, the last shogunate to control Japan. attention to these cannons, made  of  'foreign steel', or  Namban Tetsu. This all took place in Keicho 5, ( 1600 ). Kitanosho. 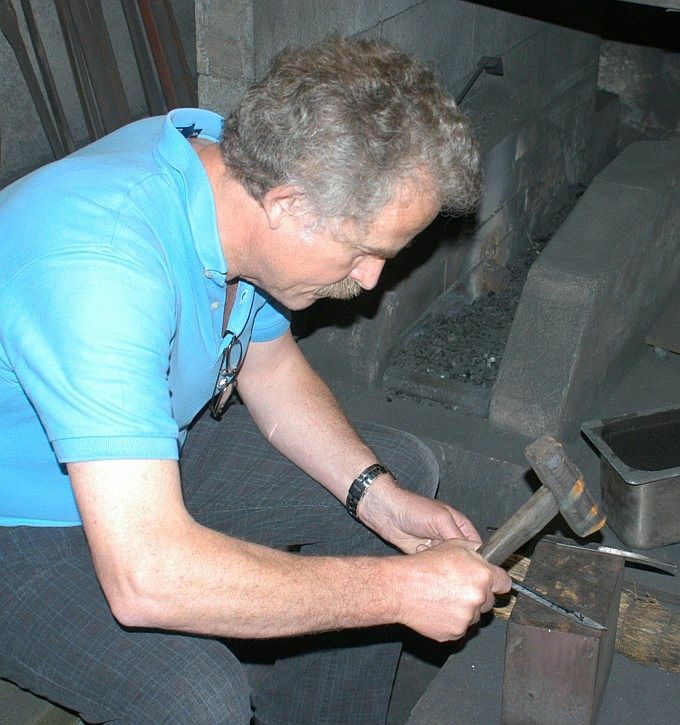 He patronized a sword smith called SHIMOSAKA ICHISAEMON. shoguns of the Tokugawa Regime, and lived in Edo to make swords for them. coming from "De Liefde" ? Tetsu  must have had a special meaning for all that fought at Sekigahara. This could be one of the reasons for the availability  of Namban Tetsu in Japan. imported iron in ancient Japan". not find a positive answer on our question. to be sold in Japan, China, Persia and to rich traders in India. So the ships left partly unloaded to Asia. No mentioning of steel and iron. But when ships are leaving partly unloaded, what was used for  Ballast? Amsterdam. A negative answer was given. ' No iron was used by the V.O.C. But this did not stop us from doing more investigation.
' 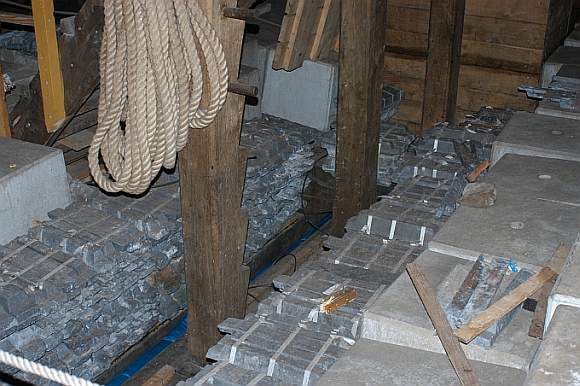 Ballast is used to put weight to a ship, like cannons and anchors. about the ballast on V.O.C. ships sailing to the East. directly placed on the ballast of gravel, blocks of iron and tropical wood. '( *8 ). entering Japan is by these ships. View on Dejima in Nagasaki Bay. techniques) under the sword smiths Hisatsugu and Tanenaga in Nagasaki. Japan. And most likely some merchants sold the pieces of iron to sword smiths. 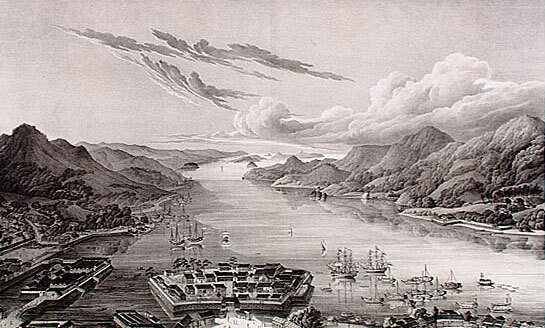 Japan in the 17th and 18th century. But how about Namban Tetsu in the 21st century? 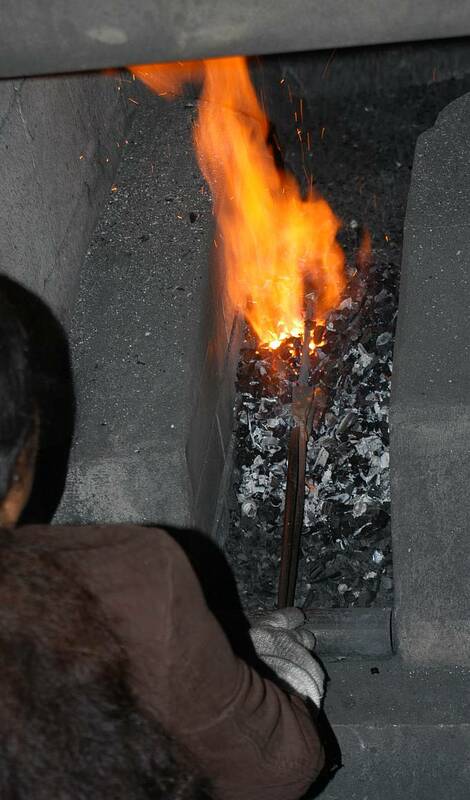 Pure iron only contains carbon. Without carbon the iron would be useless. best base to start from would be steel with as less impurities as possible. 2005 a visit to CORUS was arranged. 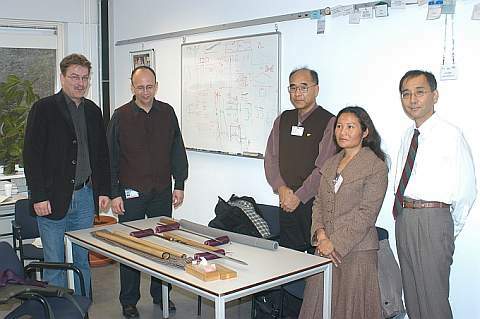 From left to right: Mr. G. Abbel, Mr. H. Visser, Mr. Y. Sugita, Mrs. H.E. 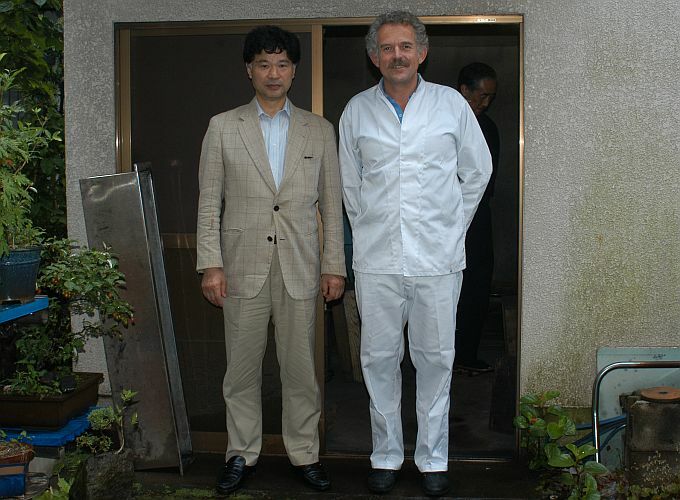 Duindam and Prof. Y. Hashimoto. 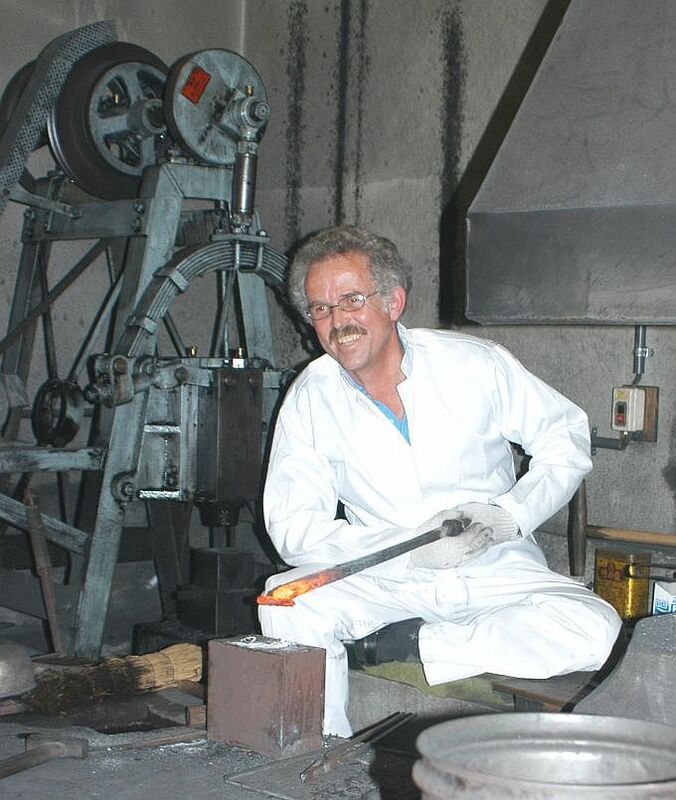 Mr. K. Van de Zwetslotenmaker taking the steel out of the mould. Two blocks of steel, the  New Namban Tetsu. During the run of 2006 news came from Japan. given a NYU-SEN award from the Nihon Bijutsu Tōken Hozon Kyokai. 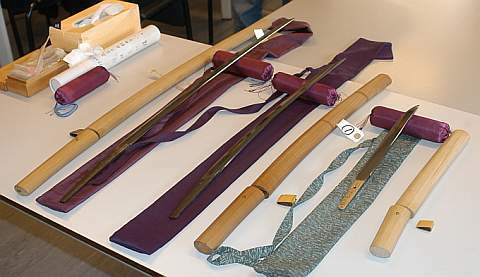 ( = The Society for Preservation of Japanese Art Swords )! 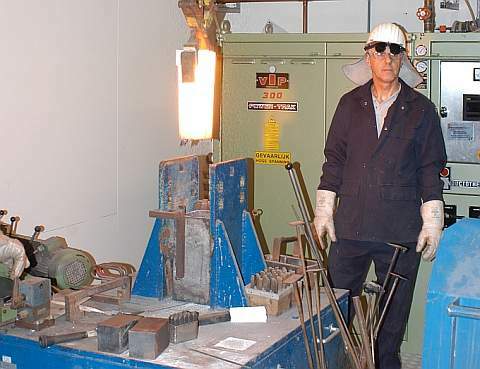 Next are pictures taken during the forging process. Making separate small bars for SHITA KITAE  and UWA KITAE. Folding in the length and width direction. Yukimitsu, hammering the sword to get the basic form. 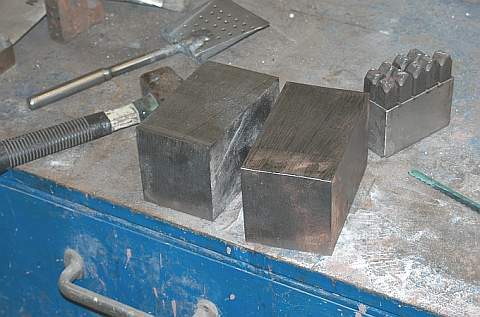 The final rough form and the inscription after finishing. Heisei 18 Year (2006) Spring. show the result of this special project. But we also have to keep next things in mind. "De Liefde" with its half loading weight must have been much smaller. compass were made of brass. 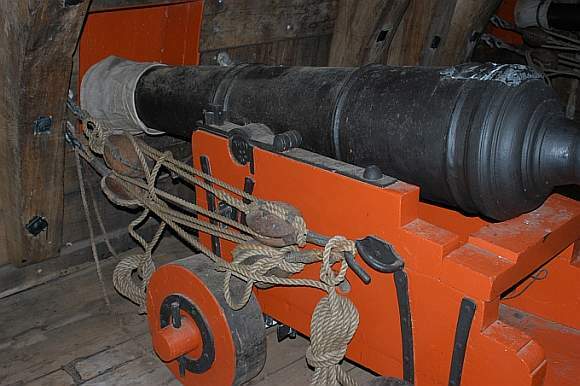 Cannon on board of the " Batavia ". After that it was time to visit the Batavia. lead and concrete necessary for a good draft and stability. A total weight of   220.000  kilogram's !!! Ballast of lead and blocks of concrete. 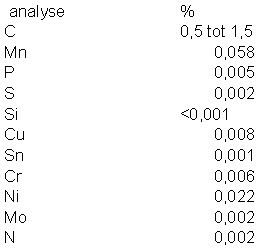 ballast for other heavy metals like copper would be evident. 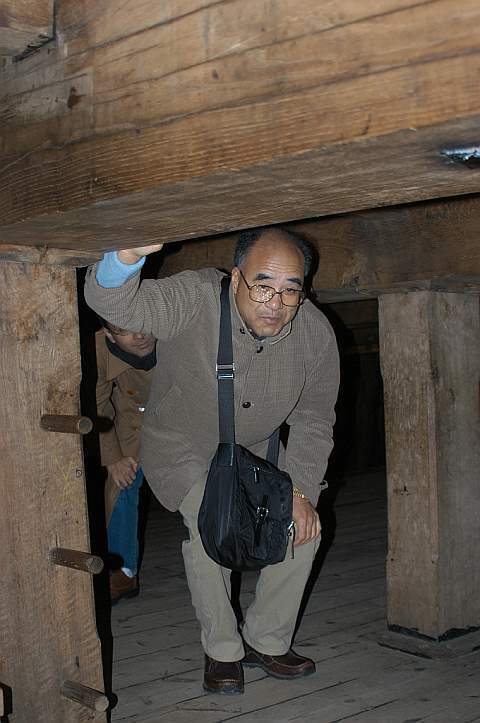 Mr. Y. Sugita and Prof. Y. Hashimoto entering the " Koebrug ". Prof. Y. Hashimoto, Mr. L.C. 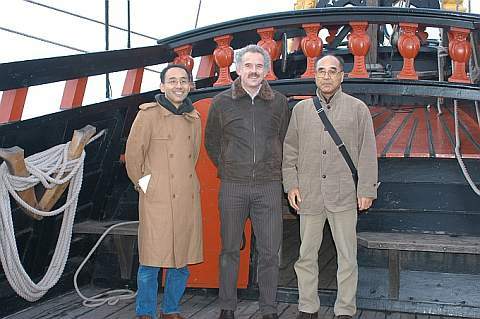 Duindam and Mr. Y. Sugita on the Batavia. The next day, Nov. 13, 2006 a second visit was paid to CORUS. the status of  Hozon. ( = Worthwhile to be preserved ) certificate nr. 365752. 2 swords from the 17th century and the Tanto from the 21st century. to see the final result. 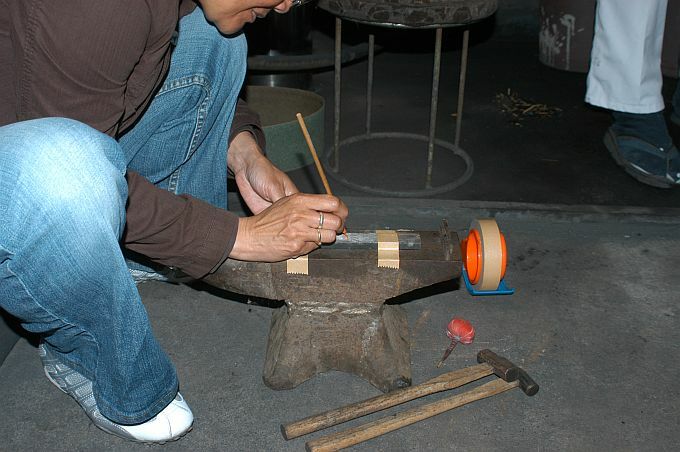 about the way of forging by Japanese sword smiths. thanking him for his  cooperation  in  this  interesting project. tanto  a  honorable  place  in  the  CORUS  presentation hall. 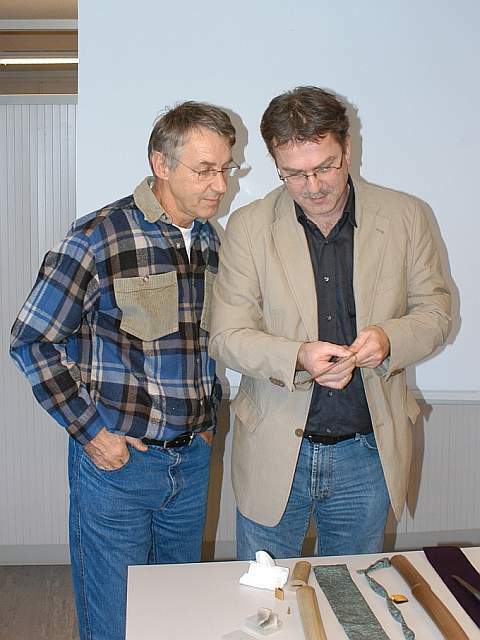 Mr. K. Van De Zwetslotenmaker  and Mr. G. Abbel admiring the tanto. a successful revival of Namban Tetsu. We thought this would close our  'Namban Tetsu Project'. But nothing proved to be further from the truth. My wife wanted to make a kogatana with the unique  ayasugihada  patern. of Namban Tetsu. And of course I had to take that opportunity! Shaping the kogatana by making the counter curve. When this is done the blade is further formed with a scraper. The Japanese name for the scraper is Sen. Working with the Sen guided by Kakuta-san. to be tempered. But we could not leave without taking a picture. Swordsmith Shigenori-san, Mrs. and Mr. Duindam, Yukimitsu-san and Kakuta-san. The next Friday we were again visiting the workshop of Yukimitsu-san. out that writing with a pen is much easier than working with a chisel. So at the end we asked Yukimitsu-san to sign them with our names. Practicing in signing the blade. thin. After having brought up the clay it needs to dry for several hours. The important play of steel and fire. 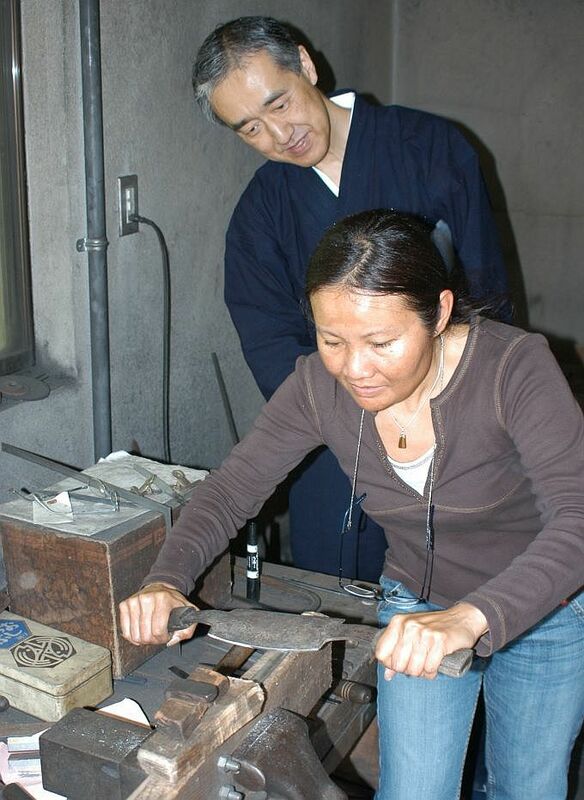 During the day we were introduced to the famous swordsmith OHNO YOSHIMITSU. He is the teacher of Yukimitsu-san and he has the important status of MUKANSA. the swordsmith's are ranked in order from high to low. swords but they are no longer judged. OHNO YOSHIMITSU and Mr. Duindam. It took a few days but then we finally saw the results from our hard labour. by Mrs. Duindam. The first Dutch woman that made a kogatana in Japan ! The kogatana made by Mrs. Duindam. The  ayasugihada  pattern in the kogatana! This picture shows the kogatana made of Namban Tetsu by Mr. Duindam. Detail of the kogatana made of Namban Tetsu. Again we thought this would close our  'Namban Tetsu Project'. by OHNO YOSHIMITSU! A fantastic wakizashi made of Oranda Tetsu! 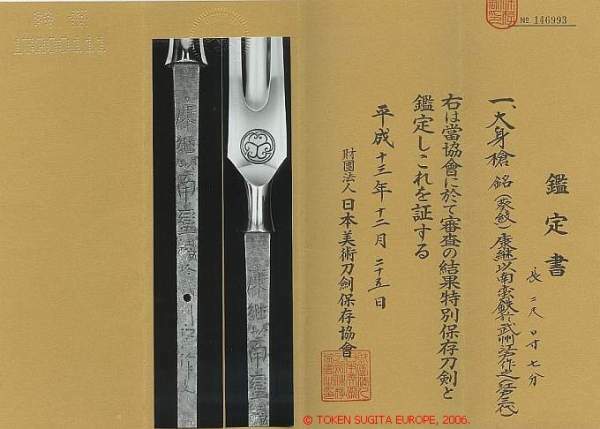 Wakizashi made of Oranda Tetsu by OHNO YOSHIMITSU. 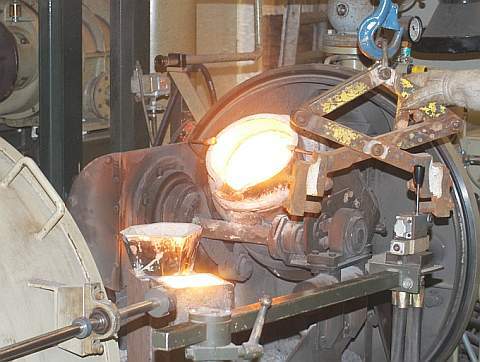 We also received a request for another 150 kg of CORUS steel! And the future ? More swords made of Namban Tetsu? Japan and The Netherlands by TOKUGAWA IEYASU. 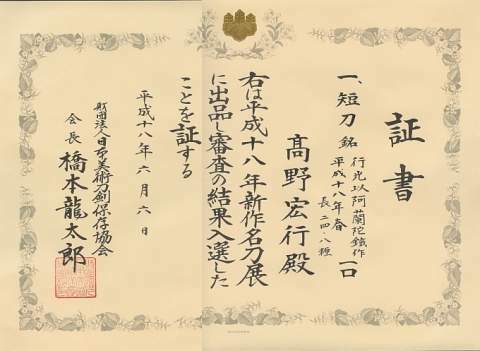 Trade agreement, signed by TOKUGAWA IEYASU. © Copyright,  Token Sugita Europe. 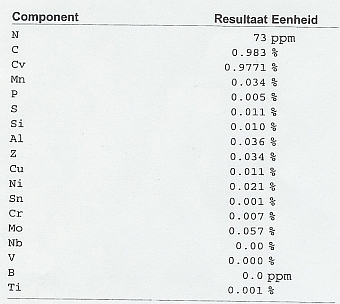 de vijand grote verwoestingen aanrichtten. ( *3 )	Source: " Samurai, an Illustrated History" by MITSUO KURE, page 104. ( *4 )	"In het spoor van de Liefde" page 42 and page 128. ( *5 )	Antwoord Nederlands Scheepvaart Museum Amsterdam. voor de nieuwe waterpoort van Batavia. stabiel en zouden  omvallen als ze leeg te water zouden gaan. Dutch commissioner of French origin François Caron oversaw the move. 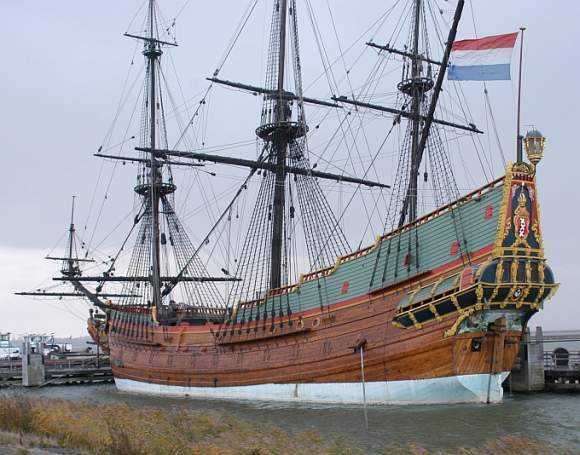 saw an average of 7 Dutch ships every year (12 perished in this period). 1 ship in 1790, and again increased to 2 ships in 1799.
by way of adoption of his father Yoshinobu, is Shodai Hizen Tadayoshi. this his elder brother Masahiro passed away. Mr. OHNO YOSHIMITSU, who has the status of Mukansa. YUKIMITSU has some NYU-SEN  prizes in Shinsaku To Exhibition. grandson of SHIMOSAKA ICHISAEMON, the 1st generation YASUTSUGU. and SHIRŌEMON became ECHIZEN SANDAI YASUTSUGU.
" 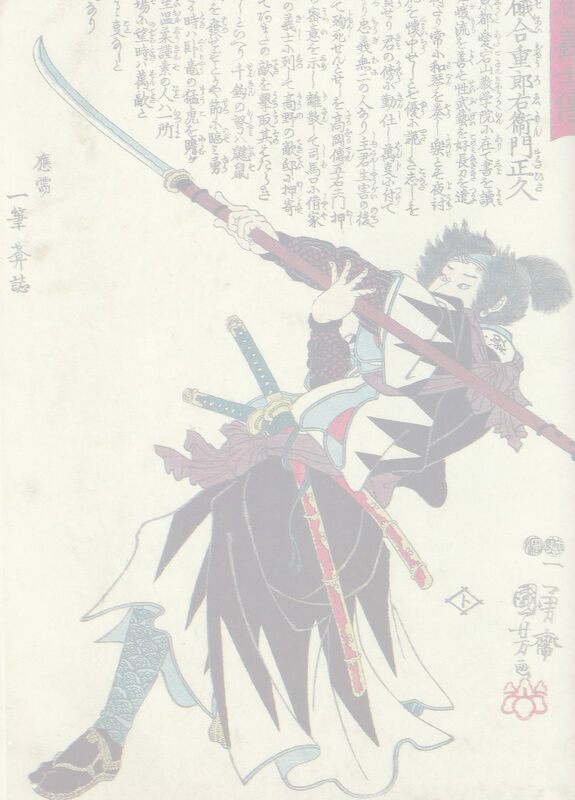 Samurai, an Illustrated History " by MITSUO KURE.
" In het Spoor van de Liefde " uitgave 1986.
" Batavia Werf " uitgave 2002. "Japanese Sword Blades", Alfred Dobrée, 1971.